On June 25 the Russian city of Sochi was hit by heavy flooding after a major downpour. The river level rose more than a meter above the norm. All precautions were taken even for dogs. Just in case. Welcome to Sochi International Airport. It looks like a swimming pool these days. Now the airport is closed, as well as the train station and main roads, since driving is impossible. 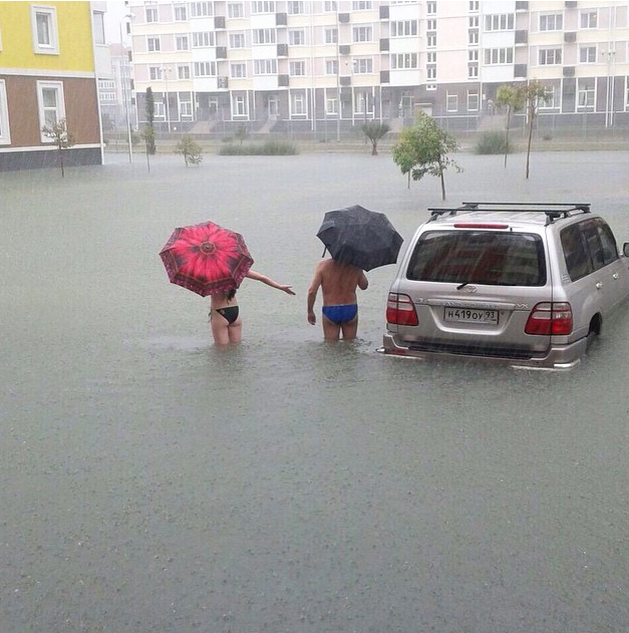 The Russian city of Lipetsk (445 km from Moscow) is also struggling with flooding. This past week, heavy rain turned the city streets into canals in just a couple of hours. But it’s not over yet. This week was hard for those who live on the Ob river in Western Siberia. This is a bird’s-eye-view of the area near Nizhevartovsk city (3,110 km from Moscow). Russia is not the only country suffering from the elements. Russia’s neighbor Georgia was also flooded on June 14. The heaviest damage hit the capital, Tbilisi. Heavy rain caused 19 fatalities. Three people died when the city zoo was flooded. Animals escaped into the city. Some of the animals had to be killed, some were recaptured. The photo shows a hippopotamus walking in a city centre.